My understanding of how autism is an integral part of myself has been a long journey. I have always been different, eccentric, with very few friends. In primary school I was nicknamed ‘dictionary’ and in secondary school was bullied. I identified as a techie person and spent a lot of time with computers and online. Around 1998, when I was in my thirties, I read a review of the book Shadow Syndromes, which made me wonder whether I might be autistic. Reading more about autism and doing some online tests convinced me I was autistic and I self-diagnosed as having Asperger’s Syndrome. However coming from a medical family I was very aware of the unreliability of self-diagnoses generally and my family did not agree with this self-diagnosis. Tests, especially online ones, didn’t seem to be much more reliable. This resulted in believing that I was likely autistic, as many of my behaviours and past experiences matched some I had read about as being autistic, but not in the confidence to identify as autistic. In 2013, in my late forties, I eventually sought a professional diagnosis. The reasons were two-fold. Having previously worked as a software developer, a technologist and a journalist, I was unemployed, doing voluntary work and had decided to go back to university to do an MA. I thought a diagnosis could help me (as I eventually dropped out, this outcome was not fulfilled). Also I had been wrongfully arrested. When I attempted to take the tube at Southwark station on 2005–07–28, police officers found my behaviour suspicious and decided to stop and search and subsequently arrest me as a potential terrorist. I thought a diagnosis would help if I was arrested again (this has not happened so far). The validation from this diagnosis had the effect of enabling me to identify as autistic and to start to explore my autistic identity. Only after this professional diagnosis did I feel a sense of belonging, the confidence to join groups such as the Asperger London Area Group (ALAG) and to attend the Autscape conference; whereas before I felt I was not entitled to do so. The diagnosis also helped me to reinterpret some traumatic experiences. It has made me realise that when police officers had found my behaviour suspicious, it was because of how they had interpreted some of my typical autistic behaviour, such as a lack of eye contact with them (i.e., I was ‘avoiding them’) and how I was dealing with the sensory-rich environment of the tube station. When I was made to wait in the entrance of the station before being led to a police van, some station’s alarms were ringing; I am hypersensitive to sound, but as my hands were still handcuffed I could not block my ears. When I was eventually processed, the custody sergeant found me ‘calm on arrival [at the police station], almost too calm’ and as a consequence I was ‘placed in a video cell on half hourly checks’. Again, my behaviour was found to be atypical. During the police interview, some questions about my laptop, such as ‘has it got anything on there about plans for any terrorism act?’ and ‘has it got anything on there that might be construed as causing a public nuisance?’, particularly bothered me. The correct answers would have been ‘yes’ as I have a word processor, an email client, etc. that could all be useful to a terrorist and most likely can be construed to be of use for anything including causing a public nuisance, however, I realised that such answers would not have been been helpful to me and challenged the questions when the investigating officer just wanted answers. Since the arrest I have become alcohol and fructose intolerant and I suspect this was a reaction to the stress. Policing in London and what happens to innocent individuals when they encounter the police became one of my special interests and I have researched, written and campaigned on civil and human rights issues such as the National DNA Database and the stop and search powers. A year after my diagnosis, I publicly ‘outed’ myself and started some autism activism: I sent a contribution to a Home Affairs Committee inquiry into policing and mental health calling for police officers to realise that an atypical behaviour can be just different rather than suspicious; to consider hyper- and hypo-sensitivities that individuals may have; and to use clearer interviewing questions. I am glad I sought out a diagnosis as it has been very helpful, but paradoxically this journey has helped me realise that for what is a neurodivergence, we should not need a medical validation. The medical pathway is not the best one, what we need is more legitimisation of self-diagnoses and acceptance of neurodiversity. 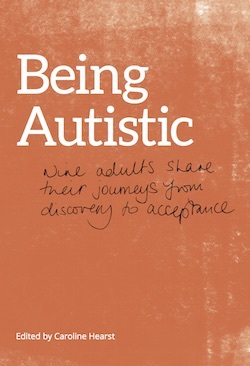 Being Autistic – Nine adults share their journeys from discovery to acceptance is published AutAngel, a community interest company. To find out more about the book and get your copy, visit AutAngel’s website.